at the Cerritos Center of Performing Arts or is it the Cerritos Theater of Performing Arts...I'm not sure about that either! 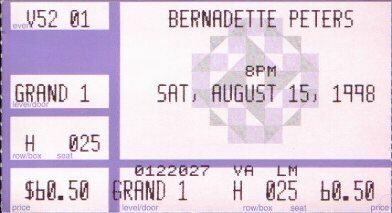 I went to see Bernadette Peters perform, it was great! She has a great voice! My favorite part is when she sang "We're in the Money", in pig latin! During intermission, while my friend I were sitting waiting for it start, we spotted Jason Alexander (George, from Seinfeld), it was really cool, but this lady staring at him the thru the whole intermission wouldn't move so we just sat there. It was fun tho!